Burt and Packard Shoe Company founded in Brockton, Massachusetts. Soon thereafter named Field and Flint Company. Field and Flint Company's FootJoy line of golf shoes becomes official shoe for American Ryder Cup team captained by Walter Hagen. FootJoy wins its first shoe count on U.S. PGA Tour. Stone and Tarlow families purchase Field and Flint Company. All FootJoy production moved to Stone/Tarlow Plant on Field Street in Brockton, Massachusetts. Field and Flint Company becomes officially known as FootJoy, Inc.
General Mills, Inc. purchases controlling interest in FootJoy. General Mills, Inc. acquires full ownership. FootJoy enters the golf glove business. Sta-Sof golfing gloves are introduced. FootJoy enters the Glove Business with the PowerStrap Glove. Introduction of the Sta-Sof® cabretta leather golf glove, which quickly becomes the #1 selling glove in golf. This begins close working relationship with Pittards of England. FootJoy enters the sock business. Golf socks are FootJoy's third core category. StaSof Glove launched. First company to advertise gloves on television during golf events. Sta-Sof® becomes the #1 glove in golf and on tour. Remains the #1 Cabretta Leather Glove today, in 2002. Acushnet Company acquires FootJoy, Inc. from General Mills. DryJoys® golf shoes were introduced. Even today, DryJoys still set the standard for waterproof golf shoe technology. WeatherSof® glove is launched with new microfiber synthetic material that mirrors a leather-like feel with improved abrasion resistance and gripping power. Continues to be the most advanced synthetic glove ever. WeatherSof® glove becomes the #1 glove in golf…remains the #1 selling glove in golf today. Titleist/FootJoy (Thailand) Ltd. started in Laem Chabang Industrial Estate, exclusively for the manufacturing of golf gloves. FootJoy celebrates the sale of the 50 millionth glove sold worldwide. DryJoys Leather SystemTM , non-membrane waterproof technology introduced, revolutionizing golf shoe industry. DryJoys with IntelliGelTM Fit-Bed® introduced, providing temperature responsive arch support. FootJoy Laser Fitting System unveiled at PGA Merchandise Show in Orlando. Introduction of specialty glove categories: Winter-Sof and Rain Grip. Launched performance niche performance products designed to extend the season of play with WinterSof ® for cool weather & RainGrip® for wet weather. FootJoy celebrates the sale of its 50 millionth glove sold. Strategic marketing/OEM product alliance established with SoftSpikes, Inc.
Introduction of DryJoys Performance Outerwear. Only a few years later FootJoy would become one of the industry leaders in the outerwear category. FootJoy introduces women's fashion category: The FootJoy Europa Collection®. Launch of Spider™ glove, with graphite enhanced digital leather geared for greater durability, grip and fit. FootJoy word mark graphics and logo updated. 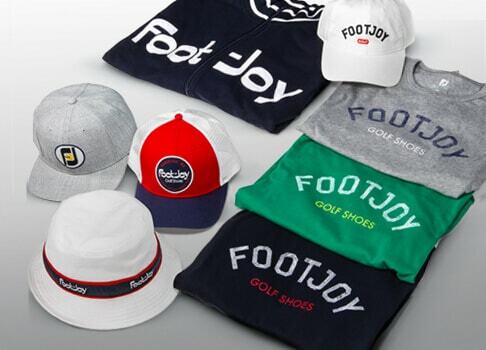 Introduction of complete line of customized products from FootJoy (gloves, socks, outerwear, and accessories). Proprietary Laser Fitting system travels the United States. Introduction of full customized glove and package program. Introduction of the 2 year waterproof welted golf shoe; Classics Dry® Premiere. Introduction of the Dry I.C.E.® golf shoe. Dry I.C.E. golf shoe is built on new Laser Last. The Laser Last is a composite of thousands of digital scans of men's feet by the FootJoy Laser Fitting System. Fast TwistTM insertion system becomes standard on all FootJoy non-Classics golf shoes. Introduction of WeatherSof GTX with advanced Grip Technology. FootJoy and Pittards introduce AQUA f.l.e.x. Leather SystemTM in Dry I.C.E. and DryJoys golf shoes. once again revolutionizing non-membrane waterproof technology. Introduction of super soft eComfortTM golf shoes. Introduction of ultra thin Sta-Sof® Premiere golf glove. Introduction of DryI.C.E. ™, first glove with exclusive climate control phase change material incorporated in leather. DryJoys re-engineered with OptiFlexTM Technology producing the most flexible DryJoys ever. Built upon the success of the developing lasts from Laser Fitting System data, FootJoy introduces the Women's Laser Last. Introduction of Contour SeriesTM golf shoe, with patented comfort technology. Reengineered women's DryJoys golf shoe, re-launched with Women's Laser Last and the Vari-Fit SystemTM. Introduction of F3TM, Women's Sta-CoolerTM, Women's Sta-Cooler Sport glove. Launched F3 Fit, Feel Flex™ glove - offering the ultimate in Fit, Feel and Flex characteristics through strategic placement of PowerNet mesh throughout the knuckles, down the fingers and Y-Flex zone in the thumb area. Introduction of GelFusion™ with iSuspension™ technology, Xdimension™, and women's eComfort™ golf shoes. FootJoy is again the #1 shoe at the Ryder Cup Matches. Introduction of Q-Mark™, an innovative custom ballmarker feature on SofJoy® golf gloves designed to stimulate incremental tournament opportunities and increase our custom flexibility. F3 Fit, Feel Flex™ glove, becomes the #1 combination glove in golf. According to Golf Datatech, achieved record market share of 47.7%. Introduction of DryJoys Featuring P.R.O™ (Platform Responsive Outsole) technology. Introduction of MyJoys™ custom golf shoes for Men & Women. Introduction of SciFlex™ glove. FootJoy surpasses 100 million gloves sold worldwide. Launched the next generation in glove science and technology – SciFlex® – The Science of Comfort™. Introduction of latest innovation in golf glove leather technology, with AloeVera impregnated leather located in the StaCooler & StaCooler Sport gloves specifically designed for Women. Introduction of the Classics Tour™ golf shoe which infuses elegant calfskin leather styling with the best in outsole technology. Introduction of FJ Impulse™ golf shoes, inspired by the spirit of the young player. Introduction of Contour Series™ and LoPro Collection™ golf shoes for Women. FootJoy also introduces the redesigned StaSof® glove, the #1 Cabretta Leather Glove in the world, and the SofJoy® Soft, leather-synthetic combination glove. In outerwear, FootJoy introduces of the DryJoys® Sta-Dry Extreme System™ 100% waterproof shell and the FootJoy® Performance Golf Mock, featuring exclusive ProDry™ Fabric. Celebrated the Rebirth of StaSof with the 8th generation of leather technology – Taction APL, exclusively tanned by Pittards of England. Achieved record market share of 51.9%. FootJoy celebrate the 100 Millionth glove sold! FootJoy introduces ECL Leather System by Pittards. ECL (Extreme Comfort Leather) signals advancements in waterproof, weight and flexibility over Pittards previous high performance non-membrane leather called the AQUAflex Leather System. Re-engineered FootJoy GelFusion with the introduction of GF:2 featuring the iSusupension outsole, GelCollar™ and GelRide™ technologies. MyJoys expanded to UK and Continental Europe. Introduction of FootJoy Golf Mock. This signals FJ's first entry into the performance knits category. Relaunched F3, SofJoy, RainGrip and WinterSof. Introduction of the revolutionary FootJoy ReelFit golf shoe. ReelFit features the BOA Lacing System, allowing shoes to be securely fastened without the use of traditional laces. Sta-Dry Grip System added to FootJoy Performance Rain Jacket. This new feature helps keep your grips dry despite the conditions. Relaunched SciFlex w/ bright new color ways. Totally re-launched DryJoys golf shoe category. This new product features a host of new technologies, all aiming to create a performance golf shoe with FLEXTABILITY. Introduction of the ProDry Superlite golf shirt. MyJoys program is expanded to include Canada. New launch of ShockStopper. MLB/CLC/ Licensed Gloves launch. Achieved record market share of 52.9%. StaSof glove celebrates 25 Years as the #1 Glove in Golf. Introduction of TechSof performance golf socks. This product features anatomically (left and right) shaped socks with targeted cushioning and support for maximum performance. Celebrate 25 years as the #1 glove in golf. Exciting new launches of 4 core products; StaSof, SofJoy, WeatherSof, WeatherSof GTX. Introduction of the FJ ICON. Designed with a premium blend of full grain leathers and exquisite calfskin leathers, finished with a sleek performance outsole. Introduction of SYNR-G golf shoes designed with a Tri-Lateral stability frame and a perforated alloy mid-foot support bridge to deliver an ultimate stable platform. 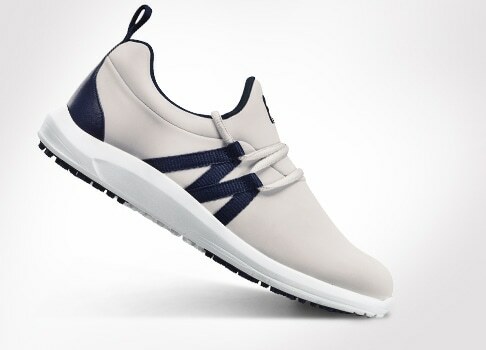 Introduction of the FJ SPORT golf shoe. This lightweight and bold design utilizes high-performance features to maximize athletic, powerful swings. Introduction of the SPIDR2 golf glove. Constructed with Digital Tac Leather (DTR), this glove delivers superior grip necessary for optimum control at high swing speeds. Introduction of the DryJoys Tour™ golf shoe. DryJoys Tour blends traditional upper styling while using next generation Stability PODS technology on the outsole. Every component in DryJoys Tour was engineered to offer enhanced platform stability without sacrificing comfort and flexibility. Marks the year of StaSof ®, 30 Years of Glove Leadership! StaSof launched with 9th generation of Leather Technology, Taction2 APL with improved grip and moisture management. Contour Casual is launched and quickly becomes the #1 selling spikeless golf shoe. After extensive research, FJ enters the full line men's golf apparel market in the US, Canada, UK, SE Asia and Australia. Launched all new GTxtreme™ glove, digital enhanced grip and durability for maximum control. Relaunched SciFlex®, Cool, Dry Perfrmance Advantage with increased breathability and comfort. Introduction of FJ HydroLite™. This system combines lightweight fabrics with 4-way stretch technology to create the lightest performance rainwear ever produced by FJ. FJ expands men's full line golf apparel to include new markets of Japan, Korea, Hong Kong, China, South Africa and Continental Europe. Introduction of new Specialty Gloves; RainGrip, RainGrip Xtreme and WinterSof. FootJoy Specialty Weather Products ranks #4 in Market Share in the US. Introduction of D.N.A. DryJoys Next Advancement Golf Shoes. DryJoys Next Advancement features the most comprehensive feature package ever delivered by FJ. Celebrated the 25th anniversary of the WeatherSof glove with the global launch and print advertising campaign of the Next Generation in Fit and Comfort WeatherSof. FJ introduces its most distinctive shoe category to date, HYPERFLEX. Featuring innovative materials, HYPERFLEX delivers lightweight support and cushioning so the player can compete at their highest level. The new SciFlex Tour™ glove is launched, boasting outstanding breathability and flexibility characteristics which have made it the glove of choice for more than 200 of the world's leading Tour professionals. FJ ICON, the flagship category in men's golf shoes, receives a major overhaul with the launch of ICON Black™ , golf shoes for the stylish player who demands Tour-caliber performance. Inspired by FJ's iconic heritage, ICON Black combines first class craftsmanship and the finest premium materials to give the golfer a high-end luxurious performance golf shoe. A completely revamped women's shoe line is revealed, led by emPOWER™ - designed with bold athletic styling to provide a comfortable, eye-catching, lightweight spikeless footwear option that performs. FJ, the #1 Glove in Golf, introduces the latest iteration of its iconic FJ StaSof® glove, the world’s #1 Cabretta leather glove for over 35 years. Global launch of FJ Spectrum, a variety of 20 colors with Premium Performance Leather Palm and colored back. In US, first trade to factory direct order/shipment without the need to stock excess product in Fairhaven. Development and launch of multi-functional bonded construction in the New SciFlex, Exo4 and GTxtreme gloves. The Thailand based technology/construction feature improves comfort/ fit and reduces the amount of hand stitching on the back of the glove. PRO/SL - Quickly becomes the #1 shoe model on every major world Tour and at retail in many worldwide markets. Fusing performance spikeless technology with a ChromoSkin leather upper, players throughout the world have gravitated to ProSL and made it their go-to - in all conditions. FJ, the #1 women's shoe and glove in golf announces its plan to expand into women's performance apparel with the launch of FJ Golfleisure. 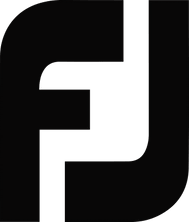 With the rapid growth of its men's golf apparel line after entering the market just 4 years ago, FJ expands into the women's market with a golf focused line inspired by the women's athleisure lifestyle movement. FJ introduces D.N.A. Helix, wrapped in innovation. Experience the latest in Tour-proven, athletically inspired performance footwear by FJ, the #1 Shoe in Golf. Introduction of DryJoys Select Outerwear. 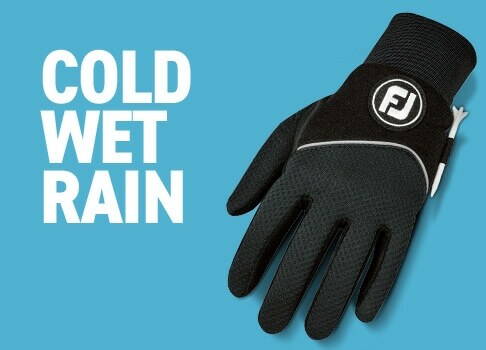 FJ DryJoys Select sets a new standard in golf rainwear. Specially engineered performance fabrics provide maximum waterproof protection and breathability in an extremely lightweight construction. Development and re-launch and introduction of the ProFLX glove. The Thailand based technology/construction feature improves comfort/ fit and reduces the amount of hand stitching on the back of the glove. The launch of the FJ1857 line of shoes pays homage to our history and golf heritage. Representing luxury performance for golf, FJ1857 shoes are hand crafted by expert shoe makers, devoted to crafting the finest golf wear of incomparable quality and design. FJ, the #1 Shoe in Golf, introduces a new category of golf shoes, named Tour-S, inspired by the best players in the world and created to deliver superior platform stability and overall Tour-caliber performance. FJ, the #1 Glove in Golf, introduces the latest iteration of its iconic FJ StaSof® glove, the world’s #1 Cabretta leather glove for over 35 years. The 14th generation StaSof features an all new Taction3 Leather from Pittards of England. FJ introduces golf's best-selling outerwear, DryJoys LTS. 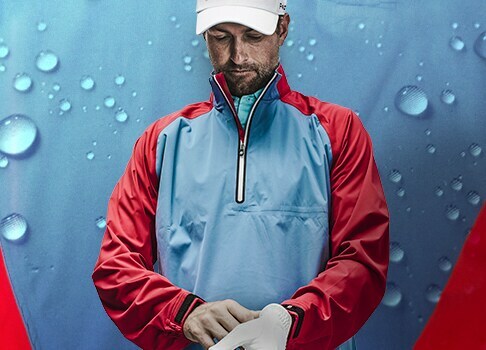 DryJoys Tour LTS Jackets are constructed from advanced technology-packed materials that deliver 100% waterproof, breathable protection for golfers in cool, windy and rainy conditions.